UK; 2University of Glamorgan, Pontypridd, UK. dairy products, are vital for human health and consumption of these nutritious foods should be encouraged. calories provided by saturated fats in the diet. it would seem that the work of two research groups i.e. they determine UK eating habits. sidering nutritional adv ice for the population. polyunsaturated fatty acids for extended periods of time. takes of PUFAs have not been proven to be safe . flict of interest with the sponsors of such projects. confounding variabl e when considering thei r conclusions. without changing the macronutrient composition is oil. such a trial will be undertaken”. requisite for the maintenance of good health. trient recommended daily allowances [RDAs]. ally, are deficient in vitamins and devoid of minerals. particularly in the young, can be a threat to good health. seven fold [32,33] with the protein remaining the same. surrounded by a preponderance of food and automation. believe, albeit with ulterior motives mostly financial. Table 1. 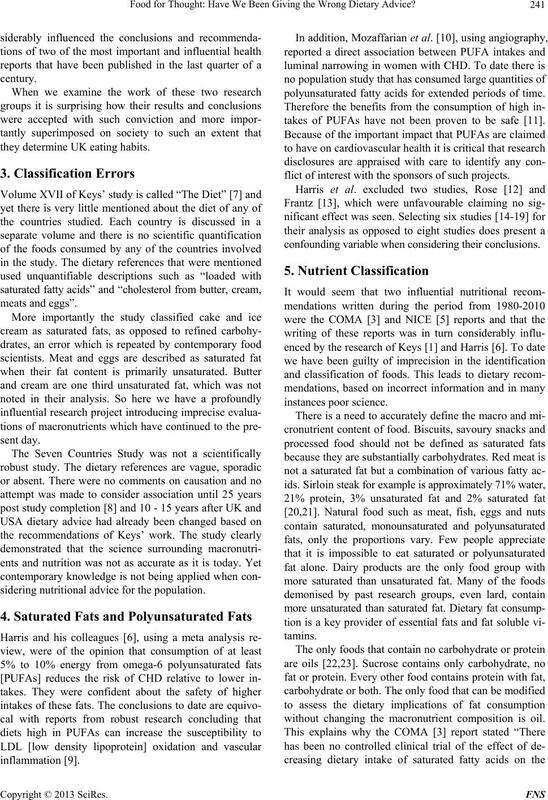 Nutritional content of foods in article. The highest value is highlighted for each macro and micro nutrient for prima facie observation. A. Keys, “Coronary Heart Disease in Seven Countries: I. 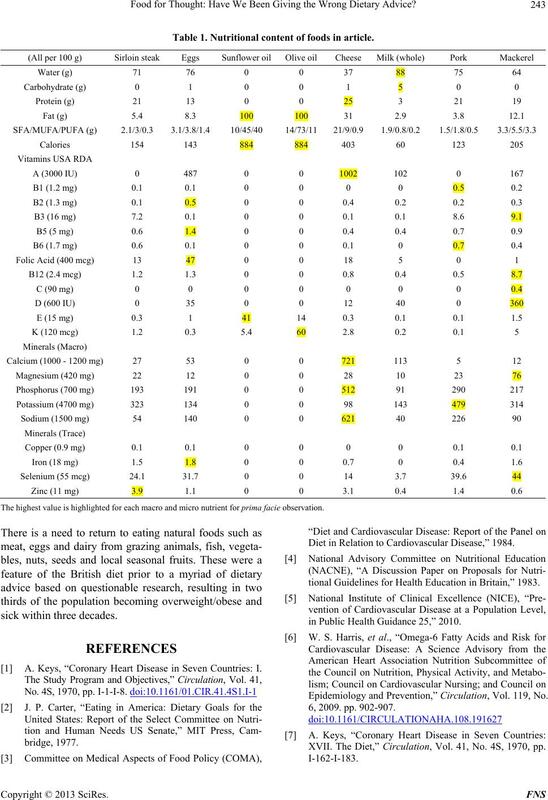 Diet in Relation to Cardiovascular Disease,” 1984.
tional Guidelines for Health Education in Britain,” 1983.
in Public Health Guidance 25,” 2010. 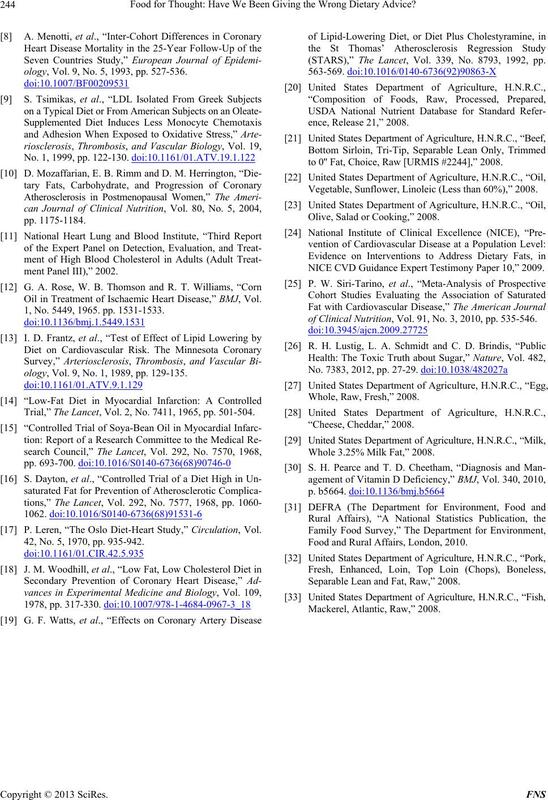 Epidemiology and Prevention,” Circulation, Vol. 119, No. XVII. 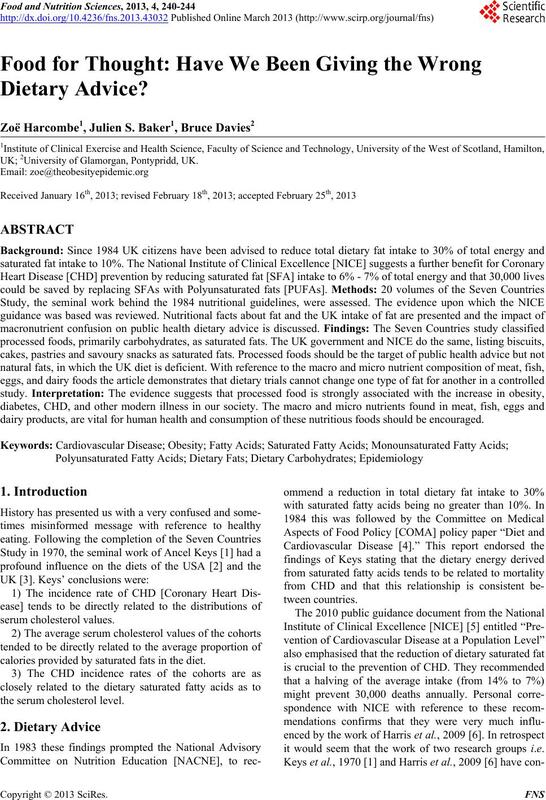 The Diet,” Circulation, Vol. 41, No. 4S, 1970, pp. ology, Vol. 9, No. 5, 1993, pp. 527-536. Oil in Treatment of Ischaemic Heart Disease,” BMJ, Vol. 1, No. 5449, 1965. pp. 1531-1533.
ology, Vol. 9, No. 1, 1989, pp. 129-135. Trial,” The Lancet, Vol. 2, No. 7411, 1965, pp. 501-504. P. Leren, “The Oslo Diet-Heart Study,” Circulation, Vol. 42, No. 5, 1970, pp. 935-942. (STARS),” The Lancet, Vol. 339, No. 8793, 1992, pp. to 0'' Fat, Choice, Raw [URMIS #2244],” 2008. Vegetable, Sunflower, Linoleic (Less than 60%),” 2008. Olive, Salad or Cooking,” 2008. 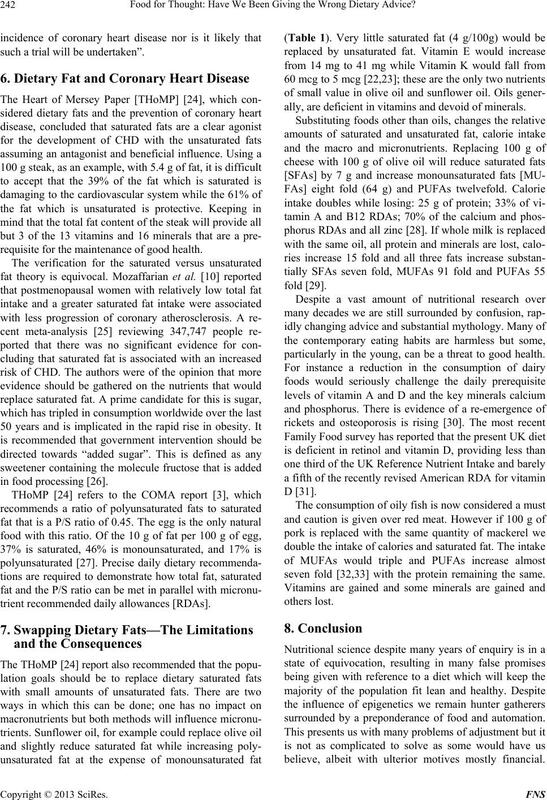 NICE CVD Guidance Expert Testimony Paper 10,” 2009.
of Clinical Nutrition, Vol. 91, No. 3, 2010, pp. 535-546. Whole 3.25% Milk Fat,” 2008. Food and Rural Affairs, London, 2010. Separable Lean and Fat, Raw,” 2008.